I took this photo on Valentine’s day after I left work. Of course I meant to do the post that day so it was relevant but I didn’t. I keep forgetting I’ve got a mobile phone with a camera and even when I remember, and I take photos with it, I haven’t got the process for getting the images off down pat. The process is getting clearer, but the memory is not. 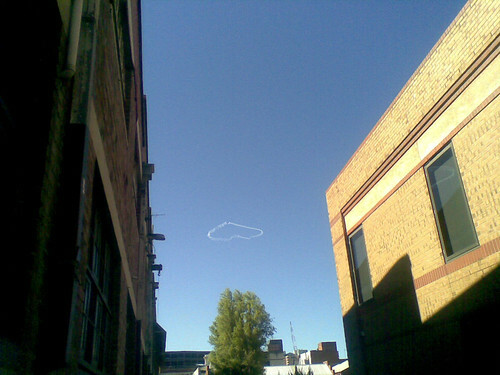 Anyway, I thought the heart in the sky was sweet and who says that a display of love has to happen on Valentine’s Day? I agree totally, any day can remind you about love. I totally relate to the mobile phone/photo/getting them off dilema. Thanks for the beautiful image. I do the same with my camera phone. I still have pics from the summer that I haven’t done anything with. Cool pic!